Pantheon's Nylon Apple Watch Replacement Bands are made from high quality breathable woven nylon. This ensures that the bands are smooth and will not irritate your skin while wearing them. Your iWatch band should be durable, sweat proof, and easily cleaned to ensure that it holds up, no matter how active you are. With many different colors and styles to choose from, there's a band for every outfit, and every activity. For everyday use; work, play, sports, and even lounging around the house, Pantheon's woven nylon bands will be all that you need. 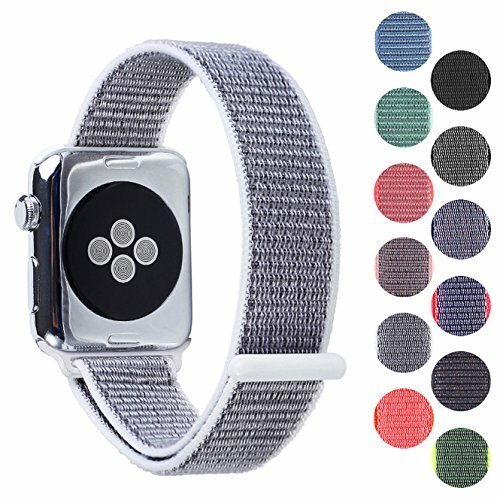 PERFECT FIT AND FEEL: The Pantheon Apple Watch replacement bands are made from a soft breathable woven nylon material that will not irritate your wrist while wearing it. Specifically made for active wear in any weather or moisture level. The next evolution in smart technology comfort. SIZING on the 38mm is similar to the Apple branded S/M (Small to Medium) and on the 42mm is similar to the Apple M/L (Medium to Large). WATER AND SWEAT PROOF: Made of high quality materials that will not fade or become affected by exposure to sweat, showers, pools, or water. These multi-colored nylon bands are waterproof and perfect for the active Apple Watch user! So whether you are running or jogging on a treadmill at the gym or competing in a 5k or triathlon, this band is all you need. WASHABLE AND EASY TO INSTALL: If your band is every dirty or needs washing, you can easily remove your band from your iwatch and clean with non-bleach cleaners. If you are going to wash in a washing machine, use gentle cycle, cool temperatures and place into a mesh bag. PANTHEON WARRANTY INCLUDED: Buy with confidence. If at any time your band fades or breaks within the first 18 months, you can contact us for a replacement or full refund. ATTENTION: If you have any issues with your band, please contact us directly, and we will provide you with excellent customer service. NOTICE: This product is not manufactured or endorsed by APPLE (Alphabet, Inc). Pantheon is a third party company and manufacturer of high quality Apple certified products (like battery cases). These bands are not apple certified (MFI). If you have any questions about this product by Pantheon, contact us by completing and submitting the form below. If you are looking for a specif part number, please include it with your message.